Anyone who has read Douglas Adams’ Hitchhikers Guide to The Galaxy will remember the incredible eponymous gadget, which when voice activated would relate all currently known information for a particular planet or race. And now, as far-fetched as it may have once seemed, nearly every traveller in the world can turn their mobile phone into such a device. For free! 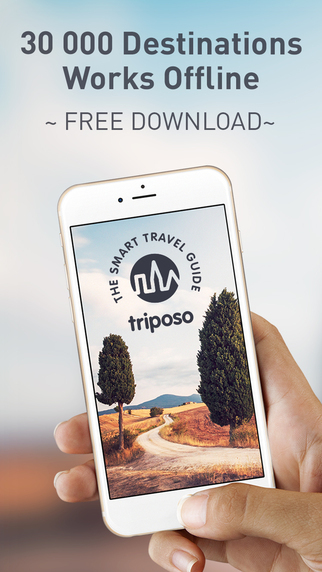 Triposo’s World Travel Guide might be limited to Planet Earth, but that seems to be the only limit! 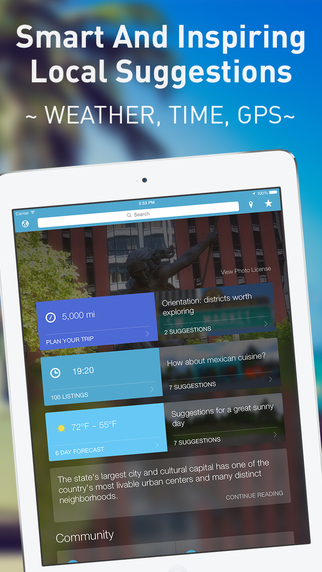 The Triposo app aims to be a one-stop travel guide for the whole world. 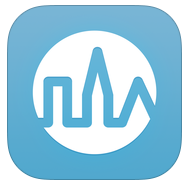 The app itself is free to download, and is essentially a shell for displaying the content of the country or city guides which are also free to download. Once the app and your destinations of choice have been downloaded, all the content it viewable offline, so you don’t have to worry about roaming charges or finding wi-fi. The app pulls content from external websites like Wikipedia, Wikitravel, Wikivoyage, OpenStreetMaps, so there is a lot of information that just isn’t in guidebooks. The app does very clever things with the information too – it can take into account not only your location but also the time of day, the weather, your previous interests, opening hours of local attractions etc. On a sunny day it might suggest a walk through the city or a nearby park, on a rainy day it might suggest a museum or exhibition, at lunchtime it will suggest a nice nearby eatery, or you can browse an extensive list categorised by cuisine. If you find yourself at a loose end or waiting, just open up the app and it will suggest something nearby, or you can kill time by learning about the historical or cultural significance of a place in some of the more in-depth articles. The detailed maps are available offline and you can use the GPS on your phone to help easily navigate your way around – which is free on most phones! As the content comes from crowdsourced websites, obviously there is the danger of inaccuracy or incompleteness. However, a link in each entry of the app lets you head on over to the Wiki article in question and edit it yourself – so as the community grows and more people submit and edit content, the better info we will all have access to! Smooth, intuitive interface, with a wealth of information very clearly presented. Can be used with an account or without. An account lets you build an itinerary and make a note of your personal highlights, which may make the recommendations more relevant, but otherwise there is little difference. Powerful filtering options lets you find hotels within your chosen area/budget, read reviews, and even book a room! Research attractions, experiences and tours, and even book tickets through the app. Weather Forecast and Current Events, which are updated each time you go online. Guided walking tours are now available, but currently only for London. Triposo Reviews – what are users saying? The app seems to be going strong, with ratings of 4.5/5 on both the App Store and Google Play. There seems to be a glitch with the current Android version which means that the downloaded country and city guides disappear and have to be re-downloaded if the device is turned off and on again. The developers are onto it, and it seems this can be avoided by downloading the offline content to your device’s internal storage rather than to an SD card. Those reviewers stated that when this is fixed, it will definitely deserve a full 5 stars. The iPhone version doesn’t seem to have this problem, and just gets consistently good reviews. Some reviewers have commented that for certain locations, information and pictures are far less comprehensive, but the same it true of published travel guides like Lonely Planet – there is always less written for less popular destinations and the further you go off the beaten track. However the advantage Triposo’s app has over bulky guidebooks (which have often started to go out of date by the time they are printed) is that every time a user (of which Triposo claims 6million!) makes an amendment or adds a new entry, the updates synch back to other users’ apps. Head on over to Google Play Store or the App store to grab your free download and start planning your next trip – or check out what it says about your hometown! This entry was posted in travel apps on July 28, 2015 by worldwideinsure.